Throughout the week, your family is scattered in so many different directions – work, school, the gym, and after school activities. There’s no question that you’re all living the good life, but the happiest hours are the ones you spend on the back patio under your Eclipse retractable awning. The whole family looks forward to time together relaxing at home in your backyard oasis. From morning ‘till night, the patio is extended outdoor living space that you all use in different ways. After Sunday brunch, the air under the Eclipse retractable awning is cool and breezy so you all settle in for a good game of scrabble that will probably turn into a weekend long competition for the family. As afternoon turns into evening and the game goes on, you realize how much you love your awnings and are glad that your friend recommended Bob’s Canvas. Bob’s Canvas in Murrieta is family owned and operated and has been selling shading products since 1989, bringing the high quality of Eclipse retractable awnings to families like yours so you can enjoy your outdoor living space. You like spending lots of time outdoors and you know that you should protect yourself from the damaging UV rays with sunscreen and your Eclipse retractable awning. Eclipse Shading Systems® is dedicated to creating the most technologically advanced solar shading solutions and committed to making your time under those shading systems as comfortable as possible. Year-round sunshine requires serious protection and Bob’s Canvas has you covered, so plan any outdoor activity you like and count on the shade of Eclipse Shading Systems to keep you cool and comfortable. The warmth of the California sun is why you live in Murrieta. 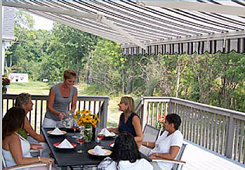 Enjoy it all day every day, your way…under your Eclipse retractable awnings.